The dip buyers had yet another great day yesterday as the large opening gap down was swiftly converted into a new high on SPX since the March 2009 low. That new high isn't a break with confidence of very strong 1370 area resistance yet, but if it does break with confidence then that opens up targets in the 1400 to 1440 area as you can see on the 6yr daily chart. My preferred trendline target would then be possible channel resistance in the 1410-20 area, with my reserve target being the 2008 high at 1440.24. 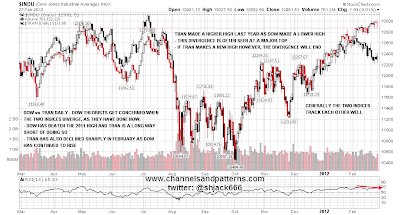 Lastly today I wanted to spend some time looking at the current Dow Theory divergence between the Dow and Transports indices. 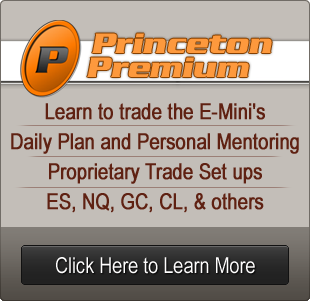 For those of you who aren't familiar with Dow Theory (DT) I'll recap it very quickly by saying that it is one of the oldest schools of TA, that it has been working well for over a century since being first developed by Charles Dow, one of the founders of the Wall Street Journal, and creator of the eponymous Dow Index. The theory behind it is essentially that in a strong uptrend or downtrend both indices need to confirm new highs or lows, and that when one index makes a new high or low that is not confirmed by the other, then it is a signal that a significant top or bottom may be close. Looking at these indices on the one year daily chart, you can see that these indices generally track each other well. 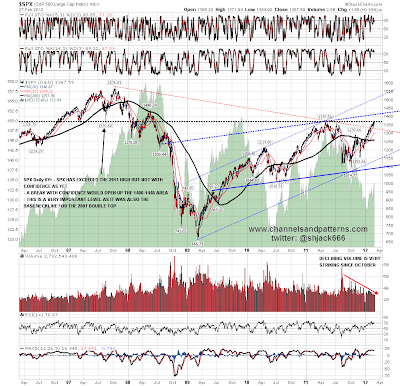 There was a new high on Transports in July 2011 that was not confirmed by the Dow and that preceded the waterfall last summer. There was no divergence at the October low, though these divergences do appear more reliably at highs than at lows. 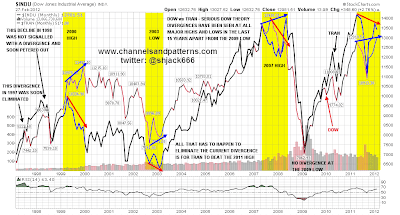 The current divergence is very striking, and comparable to that seen at the 2000 and 2007 highs. Short term I have strong trendline resistance on SPX in the 1377/8 area today, and with ES at 1373 as I write, that's obviously just above. That resistance trendline might break but it's a strong six-touch trendline that is in any case rising fairly steeply. 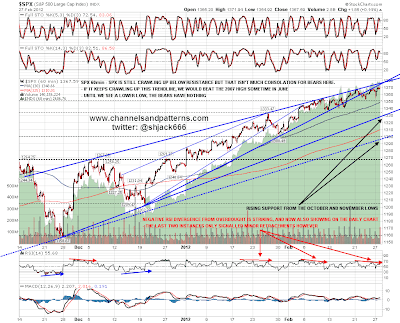 The chances are it will hold, so I'm looking for some retracement here. Have I seen trendlines like this one break in strong uptrends before? Yes, so it does happen. There's a lot of information on the charts today that isn't in the writeup, so if you want to see that you'll need to click on the charts for the full size version.